The staff is wonderful and treat you like family, the food is delicious and the location is excellent! The suites are excellent and the pictures don't do them justice. The location is fantastic and right on the beach. The fact that there are only four suites at the club was great and the staff treats you like family during your stay. The location was excellent. The room was immaculate. Most importantly the staff- they were friendly, attentive, professional and overall human. 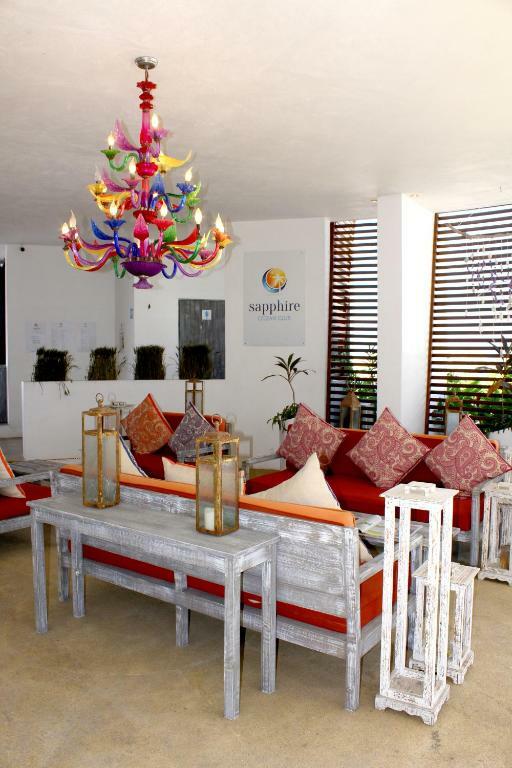 I have stayed at other hotels in PV that cost twice as much and the service was no where near what I got at Sapphire. Thank you Carlos at the restaurant, Fernanda the manager and the house keeping lady. There was not anything about the property that I did not like. The location is perfect! It's walking distance to everything or you can stay on site and enjoy the restaurant/bar. The staff is friendly and the room is stylish and comfortable. Location , on-site Restaurant, the small number of guest/suites, so you get to meet just about everyone there. Excellent location, great staff. The room was spacious and clean with comfortable bed and amenities ( microwave, cutlery, plates, glasses etc). The pool is right in front of the room door! It was a beautiful stay. The place is quiet but, the best part was the bed. I uaually have a baak problem from cheap beds. NOT so here. The bed was a dream. The restaurant at the hotel is fantastic. The servers are friendly and work hard. The hostess is a sweet lady and the room was like a little studio, with a fridge, microwave and everything you need. The pool was very cold but the ocean is steps away. The restaurant is right outside your door. The entire staff were very welcoming and attentive. The resort is right on the beach, so you are just a few steps from your room to the sand, and the resort is in a perfect walking spot from everything else we needed. Loved it! Lock in a great price for Suites at Sapphire Ocean Club - rated 9 by recent guests. One of our top picks in Puerto Vallarta.With sea views, Suites at Sapphire Ocean Club is set in Puerto Vallarta and has free WiFi. All units feature air conditioning and a cable flat-screen TV. An oven and coffee machine are also available. This property provides a sun terrace. Cruise Ship Pier is 5.6 miles from Suites at Sapphire Ocean Club, while Puerto Vallarta International Convention Center is 8.7 miles from the property. Lic. Gustavo Diaz Ordaz Airport is 7.5 miles away. Suites at Sapphire Ocean Club has been welcoming Booking.com guests since 2 Dec 2016. When would you like to stay at Suites at Sapphire Ocean Club? This apartment has a kitchenware, sofa and dining area. This apartment features a toaster, air conditioning and kitchenware. 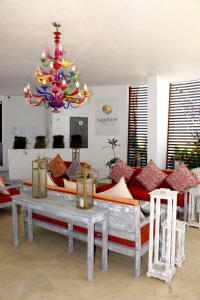 Sapphire Ocean Club is the newest adition to the famous Playa Los Muerto in Puerto Vallarta. Sapphire Ocean Club offers you a nice, clean and guided beach, A splash pool to relax with a lounge area, An open concept restaurant with a view over the beach and the pier. Our property is ideally located in the Zona Romantica, directly on the sand beach and surrounded by shops and restaurants and entertaining nightlife. Within easy walking distance is a wide variety of things to do and see. And with low cost, fixed price taxis available it’s easy to explore beyond our neighbourhood. All of our air conditioned accommodation types have been completely remodeled and upgraded. They feature a fully equipped kitchenette including plates, glasses and cutlery. Complimentary wifi is available if you want to remain connected to the rest of the world. We also offer flat screen Smart TV’s with international channels, in case you go through CNN withdrawal! The lounge area features a sofa and chair so you can get comfortable with that book and glass of wine after a day at the beach. Bathrooms are stocked with great amenities, an endless supply of hot water and a big, well lit mirror. Michel Pascal Ferrari, a Swiss national, decided in 2007 to launch a hospitality business in Puerto Vallarta, Mexico that would weave the best of both nations in an offering to tourists and nationals, providing sophisticated yet warm and casual experiences. His growing list of hospitality ventures include accommodation, food, entertainment and cruises. The south side of downtown Puerto Vallarta is a vibrant region, close to the beach. Also commonly known as Zona Romantica or Romantic Zone. This is an eclectic, funky and fun area of Vallarta. An entire city within a city, Emiliano Zapata waiting to be explored. From elementary schools to universities, 24/7 drugstores to hospitals, humble abodes to regrettable high-rises, Romantic Zone is as multifaceted as it gets. The beach Los Muertos, is Puerto Vallarta's most popular beach. Many restaurants are located right next to it, providing visitors with all the services and amenities they might need while enjoying it. Dividing Los Muertos Beach in half, is the new stylish Los Muertos pier, one of Puerto Vallarta's newest and most beautiful landmarks, that provides easy access to water taxis and day cruises that depart from the beaches. The southernmost stretch of Los Muertos beach is particularly popular with the LGBTT community. House rules Suites at Sapphire Ocean Club takes special requests - add in the next step! Suites at Sapphire Ocean Club accepts these cards and reserves the right to temporarily hold an amount prior to arrival. There is no spa on site, but there are opportunities for massages close by. The whirlpool tub did not work. We did have an excellent shower. Cold showers on 2 occasions and one employee who was not helpful in dealing with this. Inadequate privacy in afternoons due to numerous people around the chairs and pool outside my room. Due to the weather not being real hot, the pool was very cold and hard to get into because of it but we enjoyed out stay.